This is the chancel of the original Cheam parish church that was left standing when the rest of the church was demolished in 1864, following the building of a newer and bigger church on its north side. The Lumley Chapel is the oldest standing building inn the London Borough of Sutton, as the fragments of blocked window in the north wall are of late Saxon or early Norman date. The Archbishop of Canterbury acquired the manor of Cheam in 1018 and it is likely that the church was founded soon after. The dedication to St Dunstan, who was Archbishop of Canterbury 959 – 988 AD, fits well with this. He was the cathedral’s most important saint until he was displaced by St. Thomas a Becket. The blocked arch on the south side of the chapel was for an aisle which was added to the church in the twelfth century. In the 1580s John Lord Lumley converted the building into a memorial chapel for himself and his two wives. He rebuilt the ceiling, which has the date 1592 on one of the pendentives, and commissioned the three remarkable tombs which dominate the chapel today. Lord Lumley’s principal seat was Lumley Castle in County Durham. He married Jane, the daughter and co-heiress of the Earl of Arundel. Queen Mary I sold Henry VIII’s palace of Nonsuch to the Earl of Arundel in 1556 and Lumley inherited it in 1580. Lumley was a leading Elizabethan connoisseur with a magnificent collection of books and paintings and during his tenure developed a major garden at Nonsuch. After his death in 1609 the books were purchased by King James I and became the foundation of the Royal Library – which eventually became the basis of the British Library. The tomb on the right from the door is the tomb of Lumley’s first wife Jane Fitzalan (d.1577), the daughter of the 12th Earl of Arundel. The main part of the tomb is of alabaster with marble pilasters. The decoration is partly heraldic with the Lumley arms (the parrot-like popinjays) and those of Arundel (the prancing white horse). The two front panels show Jane and three of her children (all of whom died in infancy) kneeling at prayer in a building. This may be Nonsuch Palace, since through an open doorway can be seen an obelisk very similar to one which is known to have stood in the Privy Garden at Nonsuch. If so, it is the only known interior view of the palace. The incised stone medallion with a knight and dragon at the top of the tomb is extremely unusual and very fine. The first tomb on the opposite side of the chapel is for Lumley’s second wife Elizabeth Darcy, who died in 1617. The tomb is a mixture of alabaster and marble and is decorated with areas of fine low relief carving. The tomb to John, Lord Lumley (d.1609), stands next to Elizabeth’s. It is of alabaster and marble and, although of fine workmanship, it is less unusual and interesting than the other two. It is heavily decorated with heraldry reflecting Lumley’s pride in his ancestry, including the Lumley family motto Murus Aeneus Sana Conscientia (‘A sound conscience is a wall of brass’). 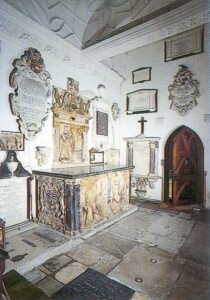 Although the tombs vary in style they must all have been commissioned by Lumley before 1590 as they are shown in the ‘Red Velvet Book’ an account of the Lumley family history and an illustrated inventory of his most choice possessions in the year 1590, now in the archives of his descendant, the Earl of Scarbrough, who visited the Chapel when it was reopened after being refurbished. The chapel contains many other memorials including ones to the Pybus family who lived in Cheam House, which stood on the west side of the Broadway to the south of Whitehall; and to the Antrobus family of lower Cheam House in Gander Green Lane, on the site of the East Cheam Manor House, between Sutton and Cheam Village. There is also a tablet on the south wall to Ann Gilpin, the five year old daughter of the Rev. William Gilpin, headmaster of Cheam school from 1752 – 1777, noted art critic, theorist and writer on the ‘picturesque’ landscape, and a memorial to Edmund Barrett, who died in 1631, and who was Serjeant of the Wine Cellar to Charles I at the Palace of Whitehall. It has been suggested that Barrett may have lived in Whitehall, Cheam, and took the name from the royal palace. A brass palimpsest (a brass that was inscribed on the back and used again for another person) and made up of portions of several old memorials joined together and engraved on the back, to form a memorial for Thomas Fromond (d.1542) and his wife Elizabeth Yerde. The brass was removed by the Churches Conservation Trust, who now care for the chapel, for repair work but the palimpsest has now been re-displayed in an improved setting. 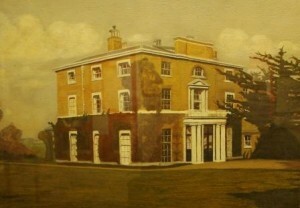 On inheriting East Cheam Manor, Thomas built a fine new Manor House, which lasted until 1800 when it was pulled down by Philip Antrobus (mentioned above), who built Lower Cheam House on its site. The Fromondes were one of the leading families of sixteenth and early seventeenth century Cheam. They remained Catholics after the reformation and suffered persecution in the later part of Elizabeth’s reign. SM3 8QH. A small deposit may be required.